On 1 June, 2012, I arrived at the British Museum to attend the opening of its newly renovated Citi Money Gallery. This was an exciting moment for me: inside was a display of money-related objects and images from Haiti that I collected with Heather Horst and Espelencia Baptiste for a research project. I couldn’t wait to see how our coins, phones, cards, and underwear with secret pockets for hiding cash would look inside this venerated institution. It was a huge success. People were spending far more time in the new gallery, lingering over the displays. Why, all of a sudden, was money so much more gripping? The answer, said curator Katie Eagleton, was the social aspect. Whereas traditional money galleries usually focus on coins, promissory notes, and other traditional forms of money, the new gallery includes a range of displays that focus on the social history and current practices of money. Not just for coin-collecting enthusiasts, the money gallery had something of interest for everybody. By putting money-related objects in social context, the Citi Money Gallery challenges many of our assumptions about how people relate to money. Our approaches to researching money and finance need to change as well. What can we learn from ethnography? Popular culture tends to depict money as something that people are greedy for or afraid of. We are either trying to get more money to fuel our consumption habits, or we’re trying to avoid facing our financial realities. But in fact, people’s interest in money is far more diverse. Most people, like ethnographers, view money as interesting for both its economic and cultural aspects—its utilitarian and symbolic functions. But conducting qualitative research into people’s financial behaviours can be difficult due to a range of money taboos, ethical issues, and practical matters. People can be very private about money and may be ashamed of their financial positions. Being wealthy can be as embarrassing as being poor, so asking people to talk about their financial positions is fraught with obstacles. Asking people to tell you their bank balance or how much debt they’re in strikes at the heart of people’s fears that they are using money incorrectly. Even financial professionals face these fears: one economist recently told me that he avoids opening letters that will tell him that he’s losing money. If the professionals can’t generate the nerve to face their financial realities, what hope is there for the rest of us? If people seem inarticulate about money it’s fashionable to assume they’re financially illiterate—but the problem is just as likely to be fear, stigma, or other social issues. If researchers misunderstand these issues, our findings maybe limited or just plain wrong. The key is in our approach to getting people to talk about it. When we started our research in Haiti, a number of people (including other researchers) told us that our project was doomed to fail: Haitians are wary of talking with foreigners at the best of times, and certainly wouldn’t be willing to talk about their finances with us. Our experience showed otherwise. We learned that asking people about what matters in their lives, and how money works for them as a social tool, is far more effective than asking people for numbers. Our participants were more than willing to tell us how they sent money by boat to their children studying in other towns, complain about how long they spent standing in bank lines, demonstrate how they used the new mobile money service via their phone, show us the “symbolic money” they carried (such as foreign banknotes), and so on. The technique we used was the Portable Kit Study. It was a challenging proposition, since it involved asking people to take all their possessions out of their pockets and bags, display them on a table, and talk about each object in turn. Coins, notes, bank cards, receipts, and identification cards were among the money-related objects we were shown. Asking about these objects allowed us to develop a picture of people’s financial behaviours without having confront people directly. For example, one young Haitian man we interviewed on the border of Haiti and the Dominican Republic ran errands for a living using his motorbike, ferrying goods and passengers across the national border. His motorbike ownership papers led to a discussion of how his wife was able to get a loan to buy his bike because she had a Dominican passport and a full-time job. This interview revealed the problems people face accessing credit, and how they can sometimes use services and social capital across the national border to solve financial problems. We ended up with quite detailed information about their incomes, debt obligations, and thoughts about their financial futures without having to ask them outright. Our experience researching mobile money use was similar. In mid-2010, we had carried out multi-sited research into Haiti's financial ecology, especially remittances and mobile phone use. In early 2011, after mobile money was launched in Port-au-Prince, we returned to the field to find out how people were adapting to the new mobile money services. A major obstacle we faced initially was that people thought we were representatives of the companies that offered mobile money services, Digicel and Voilá, and would only tell us about how much they loved mobile money. After a month or so embedded in the field, we were able to conduct object-centred interviews in which people demonstrated how they used mobile money through their phones, and explained what they used it for. This taught us numerous valuable lessons, such as the importance of learning how to use new technologies from peers. We also discovered that people weren’t yet using mobile money primarily to send money to each other, but to store it safely for their own use later. This insight later featured in a Digicel advertisement depicting an elderly woman removing her savings from hiding places in her house and instead depositing them in her mobile money account. An ethnographic approach to money research is also useful for obtaining macro-level insights. These included identifying the potential of mobile money services to grow in the context of Haiti’s financial ecology and an analysis of how different kinds of literacy intersect to shape mobile money usage. One pattern we discovered was that there was a match between mobile money’s inherent features and a broader cultural aesthetic. Unlike the Dominican Republic, where flashy clothing and displaying the latest high-tech gear is encouraged, in Haiti there is a tendency to hide wealth and other kinds of information. This tendency is visible across Haitian cultural genres, including popular culture and art. Mobile money gels with this aesthetic because it allows consumers to hide their money in electronic form. This explanation fits with our observation that the savings capacity of mobile money services was likely to be at least as important as its sending capacity. We are not alone among ethnographers who have discovered how to tap into people’s enthusiasm about money, and I have featured some of the cases I know of in the Consumer Finance Research Methods Toolkit (CFRM Toolkit), an IMTFI / Canela Consulting initiative to hightlight cutting-edge research into consumers’ financial behaviours in the context of fast-changing markets for products and services. Ethnographers are successfully adapting classic methodologies to new settings and research demands. Joseph Kaye and his colleagues used a financial tour method in the USA to build up a picture of households’ finances. They used innovative techniques including home tours to see where people kept finance-related objects (such as bills stuck on the fridge), asked people to draw maps of where their financial transactions took place, and looked at people’s financial spreadsheets (taking care to hide private information by placing sticky notes on screens). We are responding to how people use online and offline financial tools simultaneously, Tom Boellstorff’s collaborative ethnography in Indonesia shows how people use online and offline money management tools in combination. Combining face-to-face interviews with analysis of the online purchasing and payments environments, they discovered that devices were central to online shopping behaviour in Indonesia, but that people did not always use their electronic devices to complete payment. Why might people choose to deposit a payment via an ATM or cash instead of paying online? The answer was mixed: even when paying online was possible, sometimes it was not preferable due to cost of transactions, security fears, familiarity with technology, or a preference to undertake transactions face-to-face. Mack’s study is a good example of how even an online study—a medium often conceptualized as socially distant—can be adapted to ethnographic techniques. A personal approach to researching money does not necessarily require the co-presence of researchers and participants. Ethnographic research can maximize its utility by capitalizing on changes occurring in consumer finance globally. The products and objects we use to manage our money are diversifying. While this increasing diversity presents challenges for research design, it also provides more launching points for discussions about money, and this can help us to build holistic pictures of the social life of finance. To the ethnographer, diversification is not a research problem, but an opportunity, and this as true of money as any other topic of inquiry. 1. 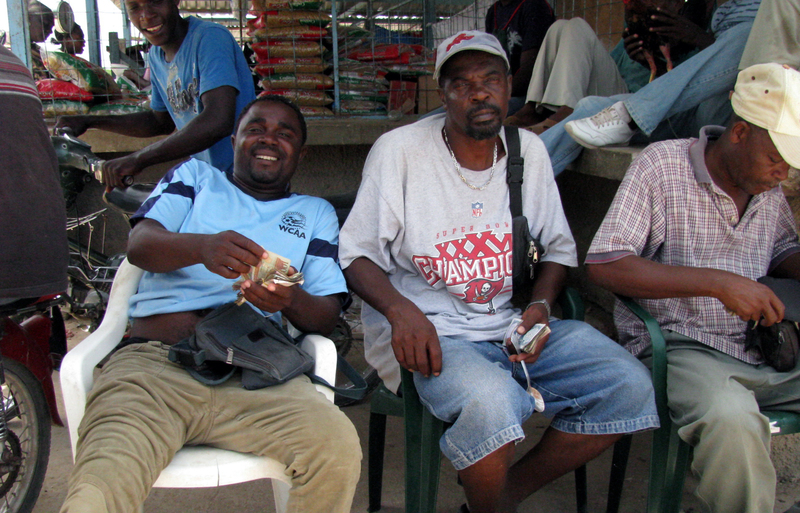 Money changers in the bi-national market on the border of Haiti and the Dominican Republic. Photo by Erin B. Taylor. 2. 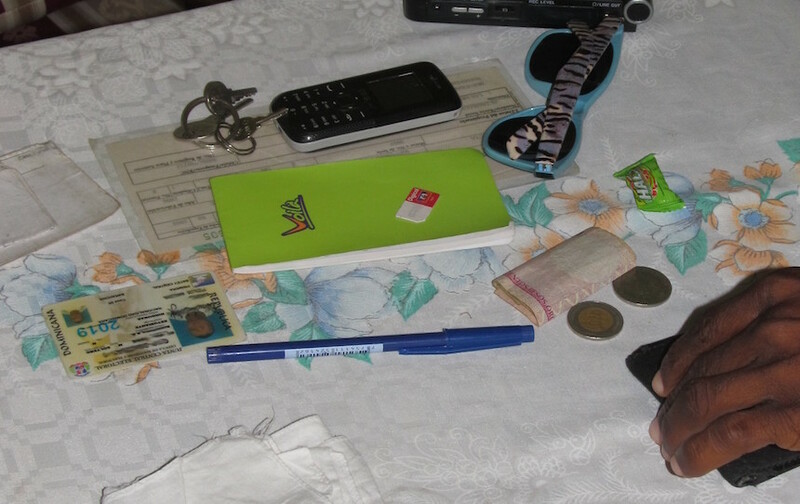 A research participant in our Portable Kit Study on the border of Haiti and the Dominican Republic shows us what's in his bag, wallet, and pockets. Photo by Erin B. Taylor. 3. 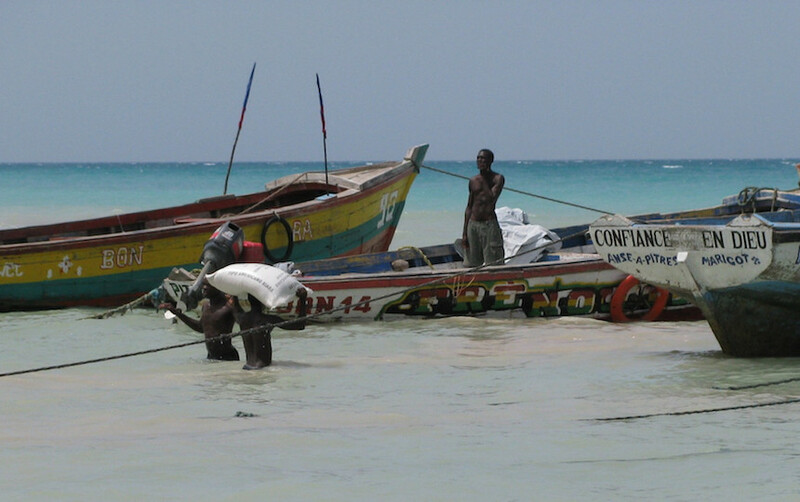 In Haiti, fishing boats carry people, goods, and money from one town to another. These informal services continue to operate alongside modern transfer services like Caribe Express and mobile money. Photo by Erin Taylor. Erin B. Taylor, PhD, is an economic anthropologist specializing in material culture and financial behaviour. She is the Principal at Canela Consulting based in The Hague, working with public and private organizations in research design, program management and implementation, capacity development, evaluation strategies, and stakeholder engagement. 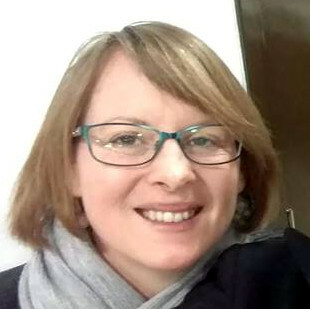 Erin created the Consumer Finance Research Methods Toolkit (with Gawain Lynch) and is author of Materializing Poverty: How the Poor Transform Their Lives. Contact erin.taylor@canela-group.com if you have a project idea or just want to talk (social) money.